Chicken drumsticks are flavorful and provide a variety of nutrients, including protein, iron, zinc, niacin, thiamine and vitamin B-12. Meaty drumsticks, easily roasted on a cookie sheet in an oven, are less expensive than many meats and are convenient whether you are feeding a few people or cooking for a larger crowd. Chicken drumsticks don't require a long list of ingredients to be juicy and flavorful. 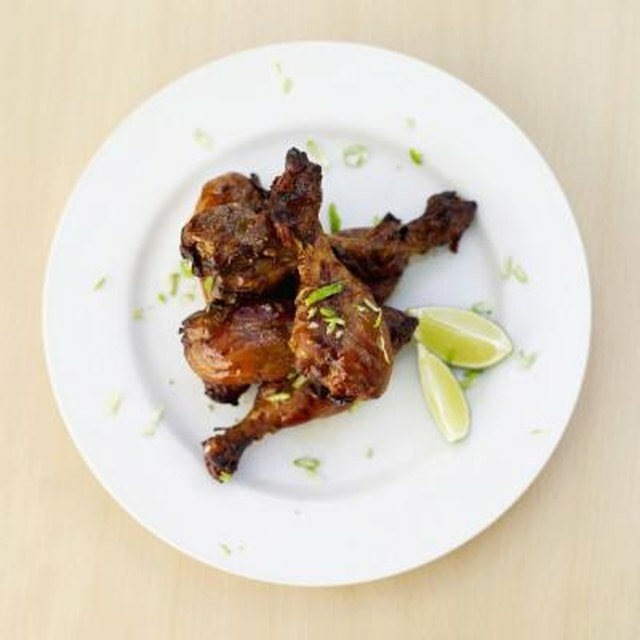 To make drumsticks using a basic recipe, sprinkle the drumsticks generously with salt and pepper. Season the drumsticks with a salt substitute or a salt-free seasoning mix for those on a low-sodium diet. A dry rub is similar to the basic recipe, but it requires more seasonings. Coat the drumsticks with vegetable oil, or use heart-healthy oil such as canola or olive oil. Mix seasonings in a separate bowl, then rub them generously over the oiled drumsticks. Use a commercial dry rub mixture or make it from ingredients such as salt and pepper, Italian seasoning, onion or garlic powder, sage, thyme, rosemary, cayenne pepper, chili powder, paprika or lemon pepper. To make crispy battered drumsticks, beat eggs in one bowl, then thin the eggs with a small amount of oil, milk or buttermilk. Create a dry breading mix in another bowl. To make a breading mix, use the ingredients of choice such as crushed breakfast cereal, crackers, flour or bread crumbs. Add salt and pepper, and then mix in additional seasonings as desired. Dip the drumsticks lightly in the egg mixture, then roll the drumsticks in the breading mix. Roast drumsticks in an oven preheated to 350 degrees Fahrenheit. Coat a cookie sheet with vegetable oil, or use a heart-healthy oil such as canola or olive oil. Arrange the drumsticks on the cookie sheet, leaving space between each drumstick to promote even cooking. Roast the drumsticks for 30 to 60 minutes, or until they are golden brown. Total cooking time varies depending on the technique used and the size of the drumsticks. Insert a meat thermometer into the thickest part of the drumstick to determine if the meat is a safe temperature of least 170 degrees Fahrenheit.